Confused about link schemes and Google link penalties? We’ve created this quick guide to Google’s link scheme quality guidelines to help you make sense of the sometimes-confusing world of link spam. Scroll down for a quick-reference table. Google considers any links that are deliberately gained in an attempt to pass PageRank to a site, with the intention of manipulating rankings, to be part of a ‘link scheme’. What’s the Deal With Link Schemes? If Google determines that you have used link schemes excessively, it may apply a penalty to your site, or a part of your site. This penalty could be applied automatically by Google’s algorithms, or it could be applied manually by a member of Google’s webspam team. The only way you’ll know if your site has an algorithmic penalty, such as Penguin, is to check whether your rankings have suffered. Manual penalties, also known as manual actions, appear as a notification in Google Webmaster Tools. I Think I Have a Penalty, Have I Done Something Wrong? Not necessarily. Certain link building practices were widely considered acceptable before Google adjusted its definitions of ‘link spam’. An external SEO agency, or your own digital marketing department, may have built links in the past that are now considered to be against Google’s quality guidelines. It’s also possible that your ‘link profile’ (all the links pointing in to your site) could be considered spammy by Google because you have naturally gained links from untrustworthy sites. Whether or not this is the case, if you believe you have a penalty, you should make efforts to clean up your link profile by carrying out a link audit. Carrying out a link audit means categorising the ‘quality’ of the links pointing in to your site, and removing or disavowing links that don’t meet Google’s quality guidelines. For a complete guide to the link audit process, and to learn how to save your site from a Google penalty, download your free eBook: Link Audit and Removal – Everything You Need to Know About Google Link Penalties, and How to Recover Lost Rankings. The table above will help you conduct a link audit, by making it easy to classify links as ‘good’ or ‘bad’, according to Google’s guidelines. 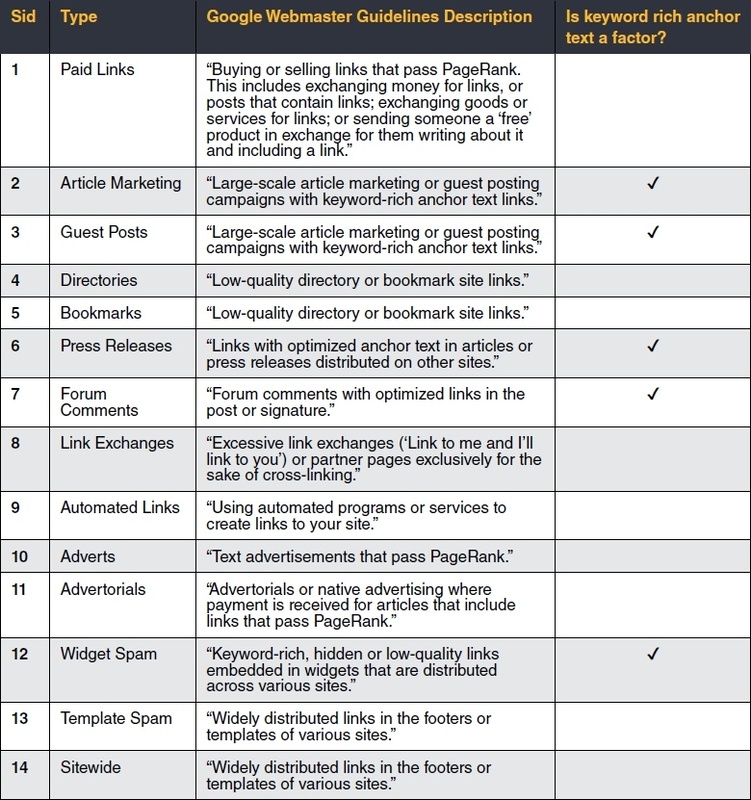 This table is intended as a quick reference to help you quickly make decisions about the quality of a link. The Type column includes the name of each link scheme. This is based on Google’s own naming conventions. The Google Webmaster Guidelines Description is, as expected, Google’s own description of the link scheme in question. It’s important to pay close attention to this description, as it often shares important information about each type of link. For example, article marketing is not necessarily considered inherently bad by Google, only articles that include “keyword-rich anchor text links”. It should also be noted that ‘nofollowed’ links (links that don’t pass PageRank) are not in violation of Google’s guidelines even, for example, if they’re included in an advertorial. The Is keyword rich anchor text a factor? Column identifies link schemes in which keyword-rich anchor text is a determining factor in whether a link scheme violates Googles guidelines. Keyword-rich anchor text refers to anchor text that includes keywords that may be of high value to your business. These are typically used to manipulate rankings by making Google associate the keyword with the page it’s pointing to. For a full explanation of the link audit process, and for more help with the terminology and processes described in this post, download your free Link Audit and Removal eBook.